1. Preheat the oven to 325º. Butter and flour an 8-inch round cake pan. 2. 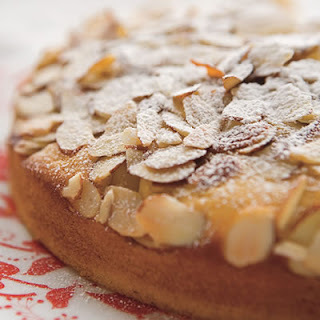 Using a food processor, grind together the whole almonds and the granulated sugar. Transfer to a medium bowl. Beat in the eggs, butter, milk, honey, vanilla and orange peel until smooth. 3. Sift the flour, baking powder and salt over the egg mixture and fold in until just combined. Transfer the batter to the prepared pan. Scatter the sliced almonds on top. Bake until a toothpick inserted in the center comes out clean, 45 to 50 minutes. Transfer the cake to a rack to cool. Sift confectioners' sugar over the top just before serving.